There are a dozen liveaboard diving destinations in Thailand each with its own flare. Many of the dive destinations in Thailand are small and primarily geared toward diving. The west coast of Thailand is on the Andaman Sea and host seven dive destinations. The diving provides many opportunities for beginning Scuba divers as well as a host of dive sites suitable for experienced divers. The Similan Islands is held by many as the best diving in Thailand and is a leading world wide destination. The Surin Islands are also an outstanding destination, however, because of its distance from the majority of the dive centers is not dived as frequent as other locations. Dive operators in Khao Lak can reach both the Similan and the Surin Islands on day trips and there are a few short liveaboards that depart from here to the islands. Most of the liveaboards that visit the Andaman Sea depart from Phuket. Phuket is one of Thailand’s major tourist destinations. I usually use this website to book in advance my liveaboards in Thailand as they usually have the lowest rates I find. I like it because they have an easy booking system. The east coast hugs the Gulf of Thailand. The Malay Peninsula portion of Gulf of Thailand has outstanding coral reefs and a number of small scuba diving destinations. The northern portion of the Gulf of Thailand has more protected waters and provides novice divers excellent diving year round. Pattaya is the leading destination in the north. Thailand Liveaboards are some of the most economical in the scuba diving industry. Scuba diving vacations to Thailand, excluding the airfare, is very cheap and likely the lowest in the world. Resort room rates are very reasonable as are food cost and entertainment. Thailand has long been a backpacker destination and it also has the most scuba diving certifications in the world. A budget Thailand liveaboard will still be very comfortable and will take you to some of the best dive spots of the world. The budget liveaboards do this at a price that is less than just a room at other international destinations. Some of the liveaboards could be compared to hostel living. There are the few Liveaboard dive boats that price wise would be in the budget range but still offer an outstanding luxury diving experience. Manta Queen Fleet: The Manta Queen fleet has six liveaboards. 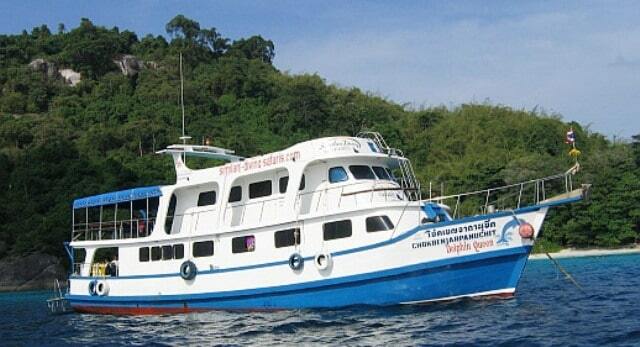 This fleet offers Scuba divers trips from 3 nights to 6 nights in length in the Andaman Sea. Divers will find comfortable accommodations and generous freshly prepared buffets. The layout of each liveaboard is different and they will cater to between 16 and 24 guest each depending on the boat. The bathrooms are shared between two cabins. Diving is done in small groups of up to five divers. 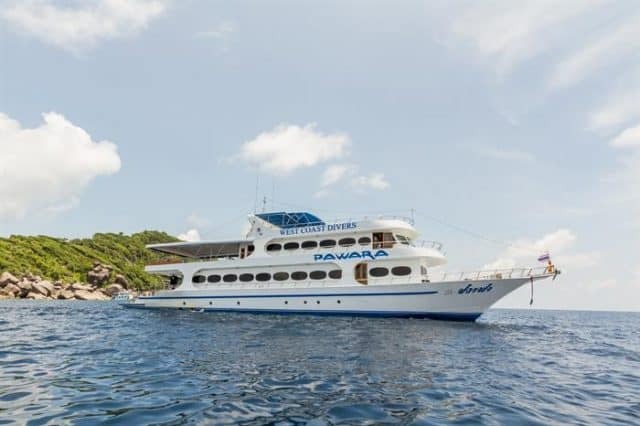 While rates vary between the vessels, their routes and number of nights, divers will find they can normally book on any of the Manta Queen liveaboards for less than $125 a night per person. MV Dolphin Queen is owned by Similan Diving Safaris. She does 4 night sailing year round with divers having the opportunity of doing 14 dives including 3 night dives. Meals are European style for breakfast and Thai meals for lunch and dinner. The Dolphin Queen has 3 decks. The main deck has 6 cabins. They are 2 Double bed, 1 Twin Bunk bed, and 3 Quad Berth cabins. The upper deck has two additional cabins that have a double bed. Bathrooms are in a common area. 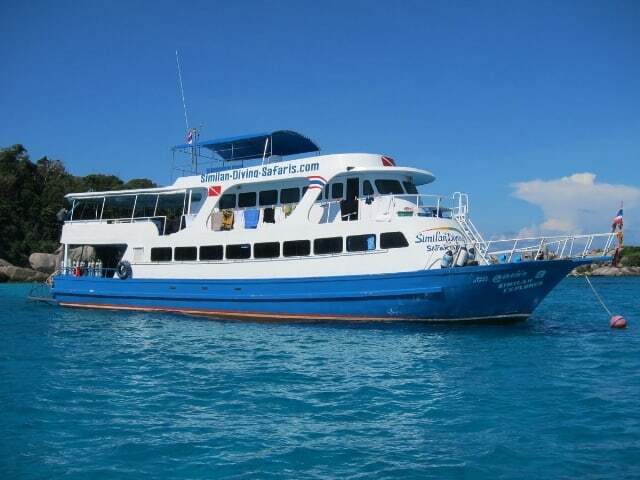 MV Similan Explorer is also owner by Similan Diving Safaris and does a five night itinerary. The 25 meter wooden monohull is very similar to her sister ship the M/V Dolphin Queen with only a slight difference in the layout of the cabins. Divers can do four dives a day except for the last day. Daily there is one morning dive, two in the afternoon and one in the evening. The last day only has two dives. Dives are done in small groups from a smaller boat. There are four divers with each guide. The Similan Explorer does do a limited number of 3 night schedules. The Junk The 33 meter long The Junk – June Hong Chian Lee dive boat is one of the more unique liveaboards in the world. She started life as a part of a merchant fleet that traded up and down the coastline from Burma to Malaysia from the 1960’s – 80’s. She was a sailed cargo junk. 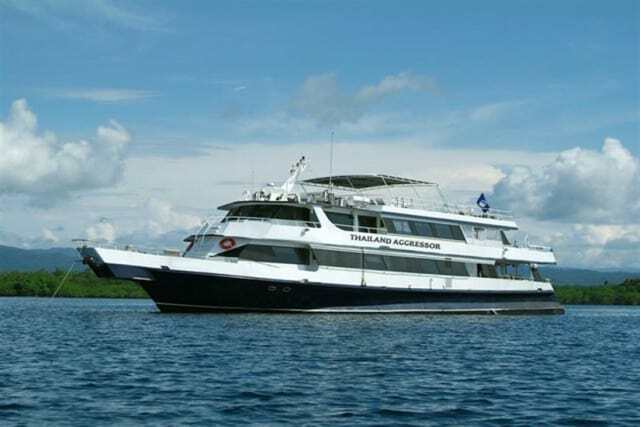 In 1997, she was converted into a liveaboard with 6 air-conditioned cabins each with en-suite bathrooms. She is owned by the same group that owns the Siren Fleet and the Master Fleet. MV Pawara Owned by West Coast Divers, one of the oldest dive centers in Thailand. M/V Pawara is a purpose built liveaboard that is 35 m long steel boat covering the Similan Islands, Koh Bon, Koh Tachai and Richelieu Rock. Nitrox certified divers can dive with Nitrox with no additional fees. She will carry a maximum of 24 divers in 12 staterooms. The two budget share a bathroom, while the rest are en-suite. MV Miss Moon is smaller than most of the other liveaboards being only 18 meter long. However, she carries only 10 divers in 5 cabins. She is owned by AIDC – Andaman International Dive Center which started in 2005. 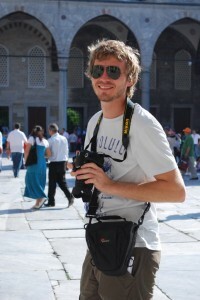 The company specialized in liveaboard trips in Thailand, Burma (Myanmar) and to Andaman Island in India. Since they are leaving from Ranong in northern Thailand, they travel to locations the other liveaboards can not reach. 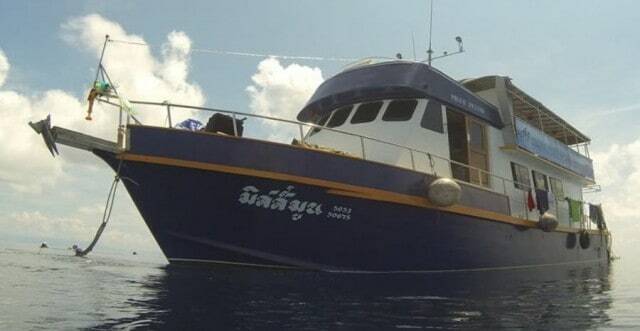 Luxury dive vessels are also found in the Thailand Liveaboard industry. In some cases they are only slightly higher than the budget liveaboards. Thailand Aggressor: The world famous luxury Aggressor fleet is represented by the the 35 meter Thailand Aggressor. This well appointed Yacht has a total of eight staterooms. 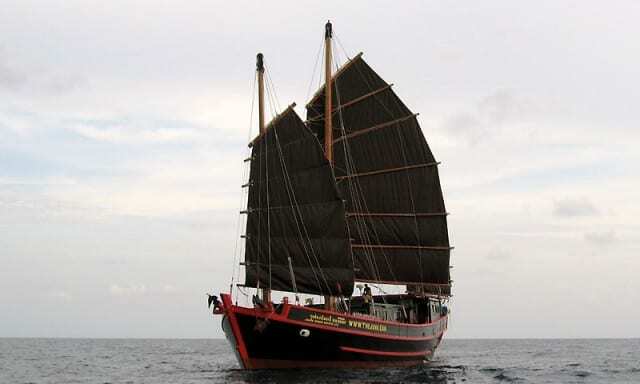 She sails year round from two ports, Rangon for diving in Myanmar, and Tap Lamu Pier, located 1 1/2 hours north from the Phuket for diving in the North Andaman Sea. M/V White Manta: From November – April the 37m MV White Manta, sails the Thailand Andaman Sea She is the sister liveaboard of the MV Blue Manta and MV Black Manta. The MV White Manta caries 24 divers in 12 Cabins. 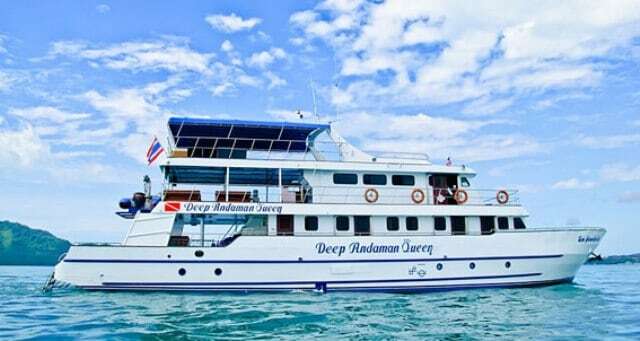 M/V Deep Andaman Queen: The M/V Andaman Queen dive boat was built in 2012 to dive the coast of Thailand and Burma. The 28 m (92 ft) vessel has nine staterooms. 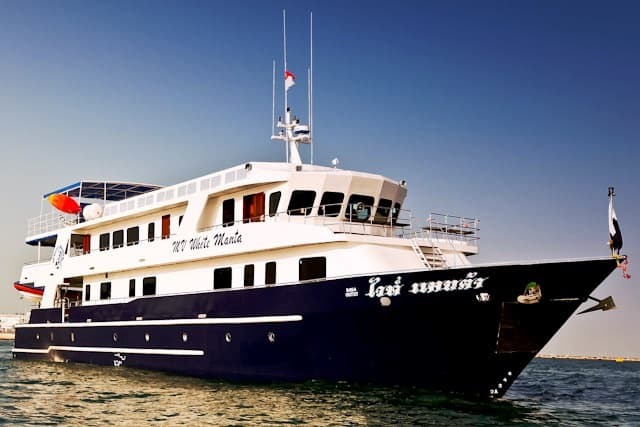 She has 5 and 6 night Andaman Sea cruises and 8 night Burma cruises. M/V Dive race class E: MV DiveRACE Class E is a 34.5m by 7.5m steel hull designed for scuba diving. Launched in 2015, she has ten staterooms. Six of the staterooms are twin shares with a private bathroom and a personal balcony. The remaining four staterooms also have a private bathroom and can have up to four occupant. The liveaboard industry in Thailand is focused on the west coast of the country. The liveaboards generally depart from one of three locations. Phuket, Tap Lamu Pier located 1 1/2 hours north from the Phuket and Rangon which is near the Burma border. Each of these areas offer outstanding diving destinations. Divers looking for flexibility in a liveaboard diving destination will find that Thailand has a number of different choices. Four and five day sailing are the most common in the budget category with three day sailing also popular. The luxury group generally sail between 6 day and 8 day sailings. The Liveaboard dive season is from October to May. However, it should be noted that the diving is often available year round. 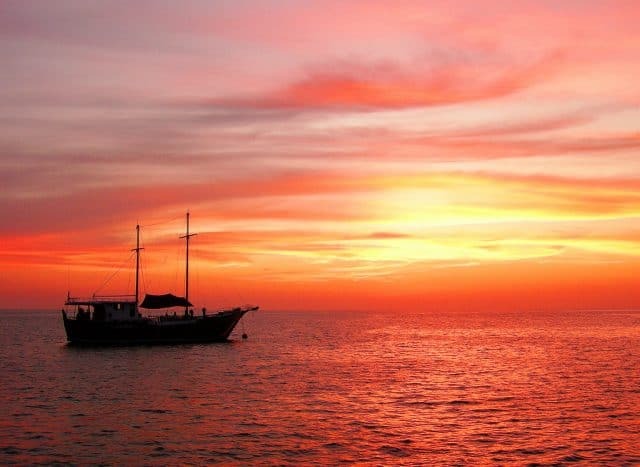 Many of the Thailand liveaboards will shift north to the Burma coast. After May, some of the liveaboards in Phuket switch to diving east of Phuket in the area called Phi Phi. Some of the liveaboards from Rangon shift further north. Many of the budget liveaboards are single ship fleets without large marketing organizations. While it is best to plan ahead, There are times when the liveaboards are not fully book a month or two before sailing. At times select sailing may show on our Thailand liveaboards last minute page. If you are considering a trip to Thailand in the near future take a look at the last minute pages. Traduction of this page in French on Croisière Plongée Thailande. We are interested in a scuba diving course for 2 days and 1 night. we do not have any prior diving experience but very interested to explore underwater world. We will be available in Khao Lak from 25th December to 28th December. Could you please assist us in program availability, price and tour itinerary. I’m not sure if this is a one-off situation, but trying to book liveaboards from Khao Lak has been incredibly difficult, time consuming, and frustrating. I paid for two live aboard trips, over $4,000.00, but have not been “approved” yet as neither the photo-copied nor the scanned versions of my passport were acceptable. Apparently I must submit a PDF file instead!! I find this ludicrous and unnecessary, but how do i do this, and is it reasonable and safe to do do? I would suggest to address this issue with the company you are booking with in the first place. Also I would had that if they’re asking a PDF, you simply have to convert your scanned document into a PDF. Best of luck, and please come back to review your trip once back! Best bubbles!